After months of speculation about a sequel to Ant-Man moving forward, Marvel confirmed today that the follow-up is happening. The studio revealed the sequel's new title, Ant-Man and The Wasp, which will hit theaters on July 6, 2018. This date was previously slated for Black Panther's release, but Marvel has pushed that movie up five months, to February 16, 2018. Ant-Man and The Wasp don't face any direct competition on July 6, 2018, but it will hit theaters one week after How to Train Your Dragon 3 on June 29, 2018 and a week before an untitled 20th Century Fox/Marvel production. The studio also shifted Captain Marvel from November 2, 2018 to March 8, 2019. Aside from the new title and release date, no details were given for Ant-Man and The Wasp, but based on the title alone, we know that Paul Rudd will be back as Scott Lang, the Ant-Man, alongside Evangeline Lilly as Hope Van Dyne, a.k.a. The Wasp. During the first end credits scene in Ant-Man, Hank Pym (Michael Douglas) showed his daughter Hope the Wasp suit that he had designed for her. Evangeline Lilly herself teased this summer that she had been fitted for The Wasp suit, hinting that we may see her in Phase Three. 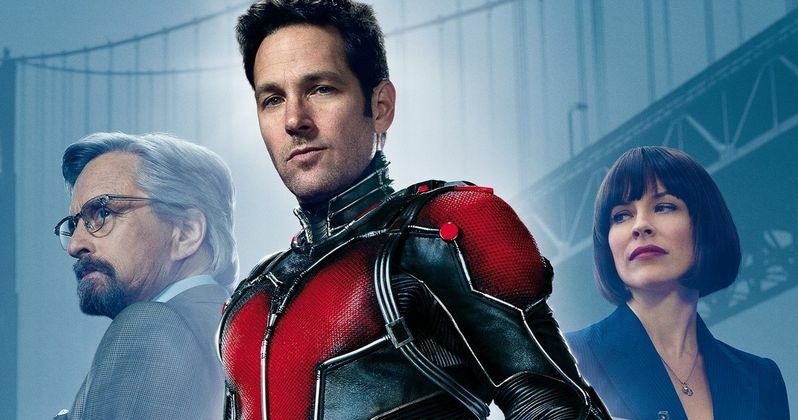 One Ant-Man star who may not be back for the follow-up is Michael Douglas, who revealed in August that he had only signed on for one Marvel movie, unlike the multi-picture deals most of the MCU stars are required to sign. The actor did say he would be open to returning as Hank Pym, though, so we'll have to wait and see if he comes on board. It also isn't known if other Ant-Man co-stars such as Bobby Cannavale, Judy Greer, Abby Ryder Fortson, Michael Peña, David Dastmalchian and T.I. will return. Peyton Reed directed Ant-Man from a script by Edgar Wright, Joe Cornish, Adam McKay and Paul Rudd, based on the story by Edgar Wright and Joe Cornish. Marvel hasn't confirmed yet if any of these filmmakers will be back for the follow-up or not. It remains to be seen what villain these title characters will face, but hopefully we'll find out more details soon. The addition of Ant-Man and The Wasp brings Phase Three up to 10 movies. The phase kicks of next year with Captain America: Civil War (May 6, 2016), followed by Doctor Strange (November 4, 2016), Guardians of the Galaxy Vol. 2 (May 5, 2017), Thor: Ragnarok (November 3, 2017), Black Panther (February 16, 2018), Avengers: Infinity War Part I (May 4, 2018), Ant-Man and The Wasp (July 6, 2018), Captain Marvel (March 18, 2019), Avengers: Infinity War - Part II (May 3, 2019) and Inhumans (July 12, 2019). What do you think about these release date changes?